I have spoken with BT numerous times this week about moving to their BT Infinity package and on every occasion they have confirmed that I can have it. My neighbours have it, the BT checker says I can have it and several BT customer service reps said they can see I can have it on the system but when we tried to place the order it would only show ADSL and not Infinity. 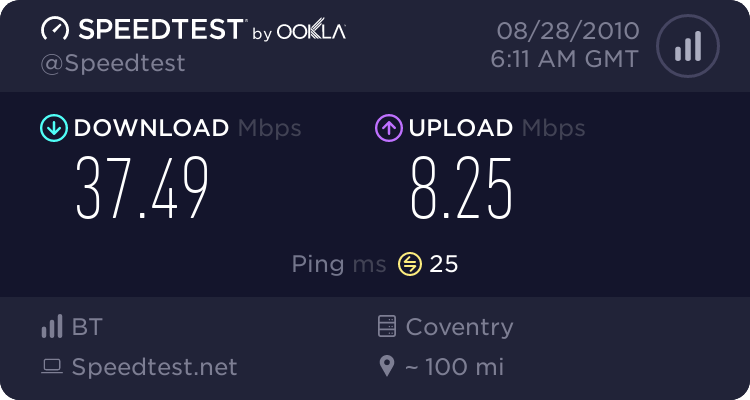 Bearing in mind I have a line that has been tested at upto 5.5mb with Sky and I am on exactly the same cabinets as others who have the FTTC CN21 network installed how can BT say I can't have it. These other people have lines that didn't have ADSL speeds higher than 1.5mb and worse attenuation/noise margins.They need to get an engineer out to my house with the correct equipment to test it rather than try to fob me off as I had a PTO tell me that I would be able to have Infinity when we had the fibre rolled out to the cabinet. Any BT staff on here who would care to try and justify this ridiculous attitude and cop out. I was in my neighbours house today and his Infinity was running at 37mb. Come on BT get this situation resolved. No ports available at the cabinet ? Can another ISP offer you service? Highly unlikely at this stage. If god had meant man to fly he would have given him more understanding bank managers! I will now wait until Sky roll it out. Both the BT Checker on their website and the customer service reps at BT who I spoke with had it as 29.8mb down & 6.6mb up before they said I can't get it...Now do you see why it's ridiculous? No, there's lots of ISPs offering FTTC. Cut and paste what the Wholesale checker says for your line anyway - this must be for your actual number and not postcode to be useful.